Plains zebra is the common name for the most common and geographically widespread species of zebra, Equus quagga, characterized by vertical stripes on the forepart of the body, which tend towards the horizontal on the hindquarters. Also known as the common zebra or the Burchell's zebra, it ranges from southern Sudan and southern Ethiopia to southern Angola, northern Namibia, and northern South Africa. Six subspecies are often recognized, including the extinct quagga (E. quagga quagga). At one point, the quagga and plains zebra were considered separate species, with the quagga classified as E. quagga and the plains zebra as E. burchelli. While the various subspecies show morphological differences, genetic studies have found little genetic differentiation in the populations, possibly insufficient to indicate distinct taxonomic units, although the distinction among the groups is useful from a management standpoint. The plains zebra provides important functions for the ecosystem and for humans. Ecologically, they are important in food chains, serving as prey for such predators as lions, hyenas, and Nile crocodiles. And, while preferring short grasses, they often crop and trample the long, low-in-protein top grasses, allowing other grazers such as wildebeests to eat the more nutritional short grasses. For humans, zebras have often served as source of meat and hide, and today the plains zebra is an important economic source of tourism. While the plains zebra is much less numerous today than it once was and its range has diminished, it still occupies a large area in Africa and the population remains stable. The main reasons for their decline over historical levels are anthropogenic factors: hunting for their hide and meat and habitat encroachment from farming. One subspecies, the quagga, is now extinct. 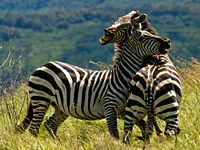 Nevertheless, plains zebras are protected in most of their range and they remain common in game reserves. The plains zebra (Equus quagga) is a member of the Equidae, a family of odd-toed ungulate mammals of horses and horse-like animals. There are three basic groups recognized in Equidae—horses, asses, and zebras—although all extant equids are in the same genus of Equus. Zebras are wild members of the genus Equus, native to eastern and southern Africa and characterized by distinctive white and black (or brown) stripes that come in different patterns unique to each individual. The plains zebra is one of three or four extant species of zebras. 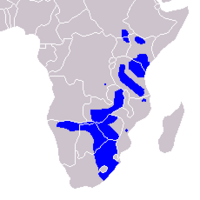 The other extant species are Grévy's zebra (E. grevyi), the Cape mountain zebra (Equus zebra), and the Hartmann's mountain zebra (E. hartmannae), although the Cape mountain zebra and Hartmann's mountain zebra are sometimes treated as the same species. The plains zebra, Cape mountain zebra, and Hartmann's mountain zebra are similar and placed in the same subgenus of Hippotigris. Grévy's zebra is placed in its own subgenus of Dolichohippus. In certain regions of Kenya, the plains zebras and Grevy's zebras coexist. The plains zebra is mid-sized and thick bodied with relatively short legs. Like all zebras, it is boldly striped in black and white and no two individuals look exactly alike. All have vertical stripes on the forepart of the body, but these stripes tend towards being horizontally arranged on the hindquarters. The northern populations have narrower and more defined striping; southern populations have varied but lesser amounts of striping on the underparts, the legs, and the hindquarters. Southern populations also have brown "shadow" stripes between the black and white coloring. The first subspecies to be described, the now-extinct quagga, was distinguished from other zebras by having the usual vivid black marks on the front part of the body only. In the mid-section, the stripes faded and the dark, inter-stripe spaces became wider, and the rear parts were a plain brown. Adults of both sexes of plains zebras stand about 1.4 meters (4.6 feet) high at the shoulder, are approximately 2.3 meters (8 feet) long, and weigh about 294 kilograms (646 pounds); however males may weigh ten percent more than females. Plains zebras live in eastern and southeastern Africa where there are only two seasons: wet and dry. They will go on great migrations, up to 1,100 kilometers (700 miles) to follow the rains, which are vital for water and food. Other grazers also must do the same thing. 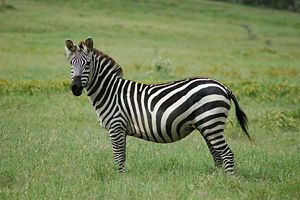 Plains zebras cannot survive very long without water and are usually found within 25 to 30 kilometers of a water source. Unlike many of the large ungulates of Africa, the plains zebra does not require (but still prefers) short grass to graze on. It eats a wide range of different grasses, preferring young, fresh growth where available, and also browses on leaves and shoots from time to time. In consequence, it ranges more widely than many other species, even into woodland, and it is often the first grazing species to appear in a well-vegetated area. A zebra's digestive system works quickly and can extract protein from the fibrous and poorest plant parts. Thus, zebras are less picky in foraging but they do spend much time eating. Only after animals like zebras have cropped and trampled the long top grasses, which are low in protein, do the other grazers like blue wildebeests and Thompson's gazelles move in to eat the newly exposed and more nutritional short grasses. The plains zebra's main predators are lions and spotted hyenas. Nile crocodiles are also great threats during river crossings. Wild dogs, cheetahs, and leopards also prey on zebras, although the threats they pose are generally minor. For protection from land predators, the plains zebra retreats into open areas with good visibility at night time. The plains zebra is highly social and usually forms small family groups consisting of a single stallion, one, two, or several mares, and their recent offspring. The adult membership of a harem is highly stable, typically remaining together for months to years. Bachelor males either live alone or with groups of other bachelors until they are ready to start their own harems. Multiple harems and bachelor groups come together to form herds, although these aggregations are highly fluid. A stallion forms a harem by abducting young mares from their families. When a mare reaches sexual maturity, she will exhibit the estrous posture, which invites the males. Her father has to chase off stallions attempting to abduct her. Eventually a stallion will be able defeat the father and include the mare into his harem. In addition to the father, the stallion must also fight rival males to get the young mare. Mares exist in a hierarchy with the alpha female being the first to mate with the stallion and being the one to lead the group. When new mares are added to the group, they are met with hostility by the other mares. Thus, the stallion must shield the new mares until the aggression subsides. A stallion will defend his group from other males. When challenged, the stallion would issue a warning to the invader by rubbing nose or shoulder with him. If the warning is not heeded, a fight breaks out. Zebra fights often become very violent, with the animals biting at each other's necks, heads, or legs, wrestling to the ground, and occasional kicking. Sometimes a stallion will lay still on the ground like he has surrendered, but once the other male lets up the stallion will strike and continue the fight. Zebras strengthen their social bonds with grooming. Members of a harem nip and scrape along the neck, shoulders, and back with their teeth and lips. Mothers and foals groom the most often followed by siblings. Grooming shows social status and eases aggressive behavior. 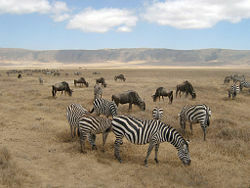 Plains zebra herds will mix and migrate together along with other species, such as wildebeests. Wildebeests and zebras generally coexist peacefully and will alert each other to predators. However, aggressive actions have been observed. Mares may give birth to one foal every 12 months. She nurses the foal for up to a year. Like horses, zebras are able to stand, walk, and suckle shortly after they are born. Plains zebra foals are protected by their mother as well as the head stallion and the other mares in their group. 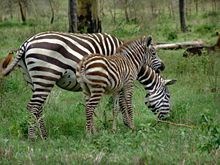 Even with parental protection, up to 50 percent of zebra foals are taken by predation, disease, and starvation each year. The quagga was the first extinct animal to have its DNA studied and this revealed that it was not a distinct species from the plains zebra. Technically, because the quagga was described first as E. quagga, the proper zoological name for the most common form of the plains zebra is E. quagga burchelli. ↑ M. A. Hack and E. Lorenzen, Equus quagga. In IUCN, 2008 IUCN Red List of Threatened Species. Retrieved April 29, 2009. Database entry includes a brief justification of why this species is of least concern. ↑ C. P. Groves and H. B. Bell. 2004. New investigations on the taxonomy of the zebras genus Equus, subgenus Hippotigris. Mammalian Biology 69: 182-196. ↑ Hack and Lorenzen 2008. Estes, R. 1991. The Behavior Guide to African Mammals, Including Hoofed Mammals, Carnivores, Primates. Los Angeles: The University of California Press. ISBN 0520058313. Moss, C., ed. 1982. Portraits in the Wild: Behavior Studies of East African Mammals. Chicago: The University of Chicago Press. ISBN 0226542327. Duncan, P., ed. 1992. Zebras, Asses, and Horses: An Action Plan for the Conservation of Wild Equids. IUCN/SSC Equid Specialist Group. Gland, Switzerland: IUCN. ISBN 2831700523. Groves, C. P., and H. B. Bell. 2004. New investigations on the taxonomy of the zebras genus Equus, subgenus Hippotigris. Mammalian Biology 69: 182-196. Hack, M. A, and E. Lorenzen. 2008. Equus quagga. In IUCN, 2008 IUCN Red List of Threatened Species. Retrieved April 30, 2009. Hack, M. A., R. East, and D. I. Rubenstein. 2008. Equus quagga ssp. quagga. In IUCN, 2008 IUCN Red List of Threatened Species. Retrieved April 29, 2009. Higuchi, R. G., L. A. Wrischnik, E. Oakes, M. George, B. Tong, and A. C. Wilson. 1987. Mitochondrial DNA of the extinct quagga: Relatedness and extent of postmortem change. Journal of Molecular Evolution 25: 283-287. Retrieved April 30, 2009. Moelman, P. D. 2002. Equids. Zebras, Asses, and Horses. Status Survey and Conservation Action Plan. IUCN/SSC Equid Specialist Group. Gland, Switzerland: IUCN. ISBN 2831706475. Quagga project. Retrieved May 5, 2009.